There are visible scales outside the bristles on the mature fruit to right of center. Perennial herb, to 50 cm. 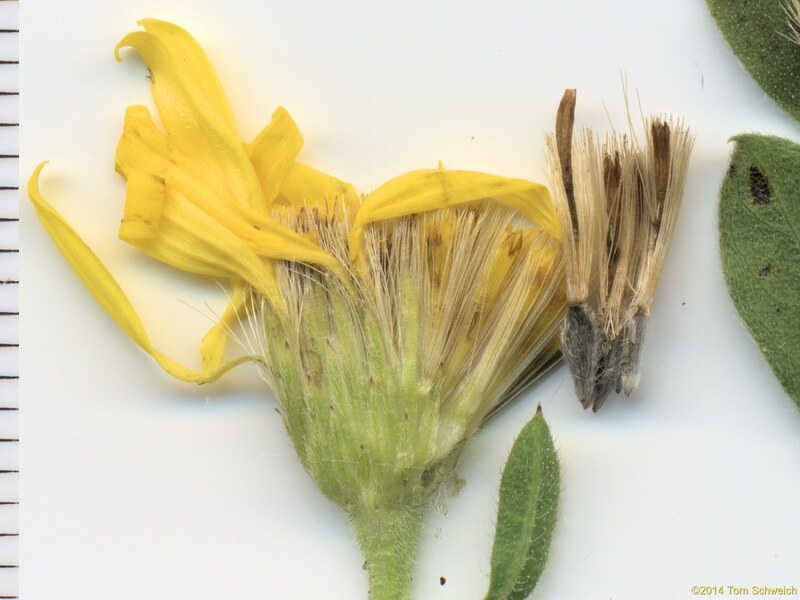 ; Leaves, cauline alternate, entire, 1-veined, distal perpendicular to stems, hairs > glands; Heads solitary, with both ray and disk flowers; Phyllaries in 2+ series, unequal, to 7 mm. ; Rays, 9 mm. ; Pappus double, outer narrow scales ≤ 1 mm. (easier to see on mature fruit), inner bristles, 6.5 mm., white; Fruit, disk 3 mm., hairy. Tucker Gulch Trail, Golden, Colorado: near shelter. Field Notes: Coll. No. 1055, 10 Aug 2014. Other photos about Species - Asteraceae or Heterotheca villosa.